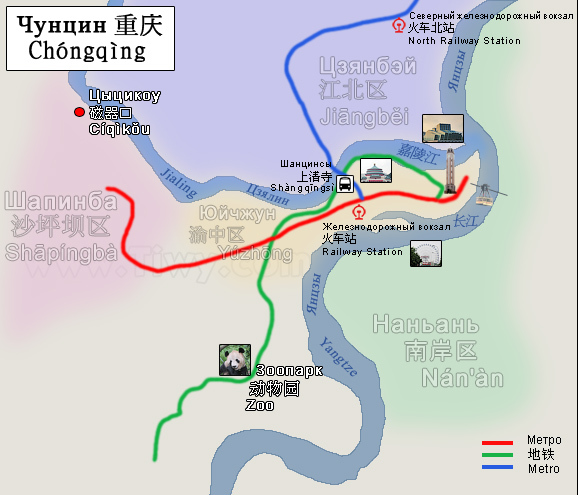 I wanted to go to Chongqing (Chóngqìng - 重庆) first of all because of its unusual location in a place where the Jialing river (Jīalíng jiāng - 嘉陵江) flows into the Long River (Cháng Jiāng - 长江) known to us as the Yangtze, where the banks go straight to the slopes on which modern skyscrapers and ordinary houses, and quite old huts alternately perch. Where everything is entangled in network of roads, tunnels, bridges and endless stairs. Where giant bridges spread in all directions across the rivers cutting across the city and somewhere near in the fog, cabins of the cable car reflectively creep over the river. In addition, Chongqing is an excellent starting point for trips around China, and not necessarily only for the province of Guizhou. Chongqing is 6000 km from Moscow, 1460 km from Beijing, approximately the same distance from Shanghai, 960 km from Guangzhou. The city itself is home to about 8 mln people and 32 mln people, as some like to say enthusiastically, live in the administrative district of Chongqing, the area of which is approximately 2 times larger than the Moscow region area. Using of these photos in printed editions or TV without the written permission of the author is prohibited.